Roberto Martinez said he is "disappointed" Everton were not able to "finish what we started" following his sacking as manager this week. He also said the summer transfer window would have been "significantly important for many reasons". 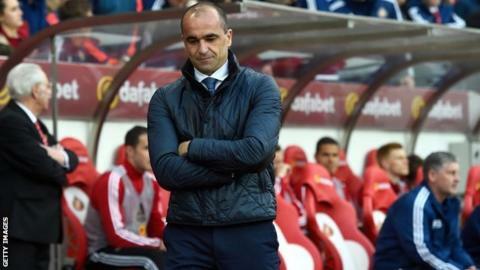 The Spaniard was sacked on Thursday with Everton 12th in the Premier League following a 3-0 defeat by Sunderland. He added: "It has been an honour to be the manager of Everton Football Club for the past three seasons." Everton reached the semi-final of both the FA Cup and League Cup this season but have only won five home league games and will finish with their lowest points tally at Goodison Park since the introduction of three points for a win in 1981. Martinez, 42, took over at Everton in 2013, finishing fifth in his first season but slipping to 11th last term. He added: "I will treasure this period as Everton manager forever - the memories of reaching a club record 72 points tally in the Premier League, reaching the final 16 of the Europa League and the excitement of reaching the semi-finals of both domestic cups this season. "I express my gratitude to chairman Bill Kenwright, who understood and supported my vision and who gave me the privilege of becoming an Evertonian." Martinez offered his "sincere thanks" to the players and staff at the club. He added: "I appreciate that over the last eight weeks our league results haven't been up to the levels that we would expect. However, over the past three years the support the fans have given to me and the team has been inspiring. "I know that the team and the fans will react well against Norwich today and I wish everyone the best of luck for three points which would match last season's league points tally." Everton host Norwich in their final Premier League of the season on Sunday with current under-21s coach David Unsworth and former manager Joe Royle taking charge. Martinez also praised American keeper Tim Howard, who is making his final appearance for the club before heading to Major League Soccer's Colorado Rapids, for his "outstanding contribution" to the club.